In January 2017, EJP changed its policy to increase its focus on Open Science practices. At the beginning of 2018, we shared some of the progress that had been made since this implementation. Half a year later, we are happy to share additional developments. Some time ago we posted about the upcoming implementation of Registered Reports (RRs), a format which allows authors to submit a research proposal that, once accepted, ensures that the resulting paper will be published regardless of its findings. We are happy to announce that RRs are now fully implemented in the submission system and the first reports have already come in! If you are interested in submitting an RR, check out our guidelines here. Of all submitted articles, 39.1% submitted in 2016 received one or more open science badges. This number has increased to 54.2% in 2017. 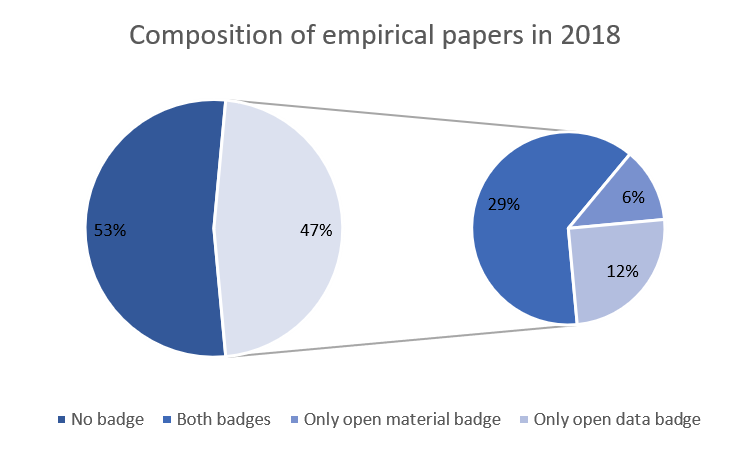 Of all articles published in 2015 and 2016, 2.7% received one or more open science badges. This number has increased to 47.8% in 2017 and 2018. 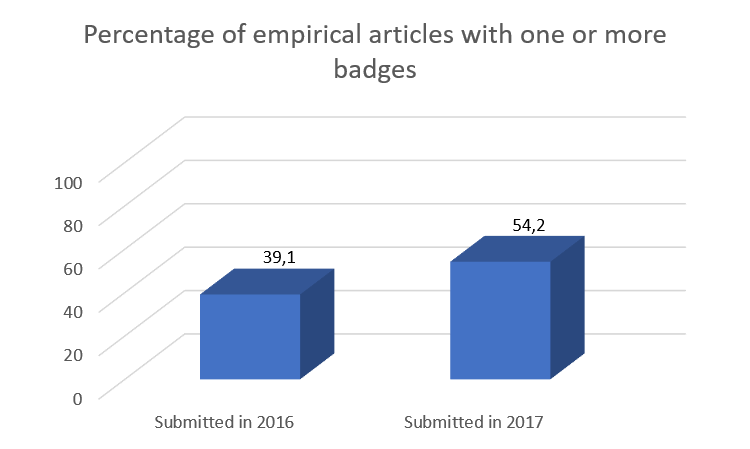 Finally, of all empirical papers published so far in 2018, 29% have earned at least one badge. Note. The 47% in the pie chart on the left represents all articles with one or more badges. The Center for Open Science (COS) maintains an online, continuously updated spreadsheet ranking journals according to their transparency score -- a score which is calculated based on implementation of the Transparency and Openness Promotion (TOP) guidelines. We are proud to announce that EJP was the highest ranking personality journal, with a score of 20 (with only two, non-personality psychology journals ranking higher with a score of 23). We are excited to be publishing top notch personality research that is open and transparent and will continue to do so.